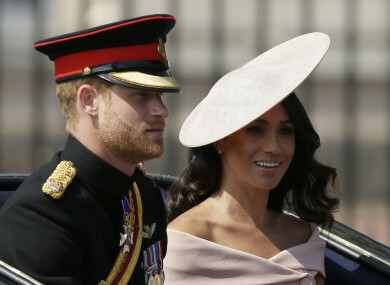 THE DUKE AND Duchess of Sussex will visit Dublin on 10 and 11 July. Kensington Palace confirmed the news this morning on Twitter. Tourism Ireland said the royal visit has the potential to deliver a major boost to Irish tourism. “We expect a large media contingent will travel to Ireland to cover the visit, bringing the story to millions of people in Britain, and elsewhere around the world, and providing a truly unique opportunity to highlight Ireland as a wonderful holiday destination. Tourism Ireland will take every opportunity to exploit the tourism potential from the extensive publicity around the visit. The British Embassy to Ireland tweeted to say they were looking forward to welcoming the newlyweds to Dublin next month. Email “Prince Harry and Meghan to visit Ireland”. Feedback on “Prince Harry and Meghan to visit Ireland”.